Although Prohibition has been over for almost ninety years, Americans are still fascinated by the period, and Utahans, especially in the liberal hotbed of Salt Lake City, are proud of Utah’s link to Repeal Day, December 5, 1933. 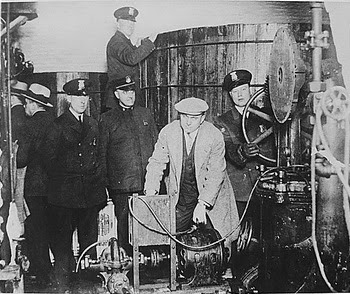 This year we enjoyed Ken Burns critically acclaimed three-part series “Prohibition” on PBS that covered not only the usual topics of gangsters, bootlegging, and police raids, but examined the social movements leading to Prohibition and the impacts Prohibition had on society. The popular HBO series, “Boardwalk Empire” follows the tribulations of gangsters active at the beginning of Prohibition (circa 1920). Now, thanks to Ken Burns, when Nucky or Jimmy talk about making a deal with George Remus of Cincinnati, we know that he’s a real person and how his life turned out. Prohibition is a good example of unintended consequences. While the intent was to achieve worthy goals like less alcohol abuse and less abuse of women and children, and Prohibition did make some progress on these goals, it also contributed to the growth of organized crime, decreased respect for the law and the government, and (on a more positive note) helped give birth to women’s liberation. Legend has it that one of Prohibitions positive contributions (perhaps the only lasting one) was an increased interest in cocktails and in cocktail recipes, mostly due to the poor quality of the booze that was available. In reality, Prohibition did the cocktail culture a lot of harm. Many bartenders were put out of work (at least temporarily) and there was a diaspora of some of the best to other countries where they could ply their trade of making high quality cocktails. It’s hard for us to believe that Prohibition actually lasted thirteen years. Ultimately, though, people came to believe that the bad outweighed the good and a movement to repeal prohibition gathered steam. Repeal was a plank in the Democratic Party platform in 1932, and FDR promised to support repeal in his campaign. Because Prohibition was implemented via constitutional amendment (the 18th), it could only be repealed via constitutional amendment (the 21st). The 21st amendment was proposed by congress in February, 1933, and sent to the states for ratification. Three quarters of the states had to ratify within seven years for the amendment to pass, but the deed was done in less than one. Most constitutional amendments are ratified by state legislatures, but the 21st was to be ratified by state constitutional conventions. This anomaly may be the reason why, over the objections of the LDS Church, which pointed out some of the good things prohibition had accomplished, on December 5, 1933, the great state of Utah became the 36th state (and the third state that day, thanks to being located in the Mountain time zone) to ratify the 21st Amendment, thus repealing Prohibition. So when you celebrate Repeal Day (you will, won’t you? ), be sure to raise your Gin cocktail (what better liquor for Repeal day?) in the direction of Utah (if you’re not already there) and drink a toast to the state that brought the Repeal of Prohibition to all America. Note: links have been provided to all sources used for this article.